Intruders, a.k.a.Shut In, is an effective home invasion thriller with outstanding performances and tight pacing. It is a play on the Home Invasion sub-genre that doesn't get explored that often. Only two movies come to mind that have touched on agoraphobia as a plot device; Stephen Moyer's Restraint and Sigourney Weaver's Copycat. Even though they share this similarity, Intruders goes into, somewhat, newer territory. Anna (Beth Riesgraf) is an agoraphobic young woman who hasn’t left the family house in a decade. Her brother Conrad (Timothy T. McKinney) is her only companion, but he is quickly taken over by cancer, leaving Anna alone in their large Louisiana estate. Three thieves catch wind of Anna hoarding a large sum of money, thanks to Meals on Wheels delivery boy Dan (Rory Culkin), and wrongly assume she is attending her brother’s funeral. They break into the house to take it, but soon find they are not alone. Anna now finds herself trapped by not only this trio, but her phobia as well. The whole movies hinges on the character of Anna, if this performance is not hit just right then the movie would fall apart. Thankfully Beth Riesgraf kills this role, she delivers a performance with both depth and sincerity that makes you invested in the character. She is able to reveal much of her character's backstory with no more than raw emotion. This is Riesgraf's movie and everyone else is just along for the ride. The plot may seem like it has been done before, but when you get to the actual reveal I will guarantee you didn't see it coming. What could have been your average run-of-the-mill horror thriller or copycat truly turns onto territory that very few movies tend to tread. The entire movie is tight and the pacing is just perfect, but it does hit a small hitch when we come to the movie's climax. It doesn't pay off in a way that you'd expect and leaves you a bit unfulfilled. Maybe It's a bit cliche, but I would have liked to see it go where it felt like it was setting up to go (you'll understand). Intruders might have one small hitch but it doesn't destroy the overall product. Adam Schindler, T.J. Cimfel and David White have created a solid entry in the horror home invasion sub-genre. 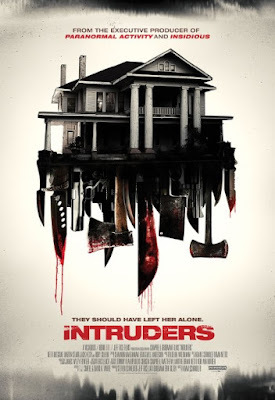 Intruders has a great cast, believable plot, tight pacing and tension for days, that alone warrants a rental today.